My stint as Secretary of Dwight’s Parents’ Association ended yesterday with an appreciation dinner hosted by the school’s Head of School at the SkyFarm, the posh restaurant at the 50th Floor of the FKI Tower at Yoido. The SkyFarm gives an amazing view of the Han River, the streets of Yoido and the full view of the Yoido Park. Aside from the view and the company, we enjoyed a 5-course meal all through-out the night. But our private dinner isn’t for blogging. What makes this interesting is the little trivia I learned courtesy of my co-parent. This is also the venue of the Korean showbiz power couple’s, K-pop singer Rain and Korean celebrity Kim Taehee, post wedding party. The celebrity couple has also recently announced that they are pregnant with their first child. The SkyFarm speaks of elegance and exclusivity and complements their small and intimate wedding venue, the Gahoe-dong Catholic Church. 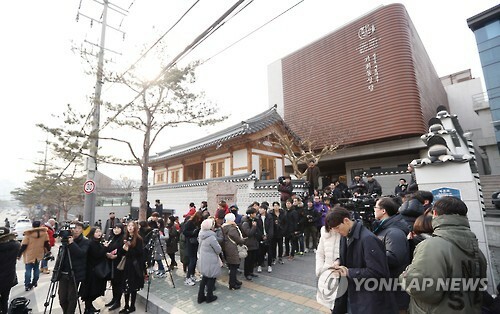 This Yonhap news photo clearly shows the church which made it easy for my friend to immediately remember it. Oh well, that’s all the interesting ones about these K dramas. But the best trivia about this place is, the restaurant is actually in the same building where my hubby works:-). Dinner venue was supposed to be very convenient for him… if he was around. He was off on a business trip, as usual. The SkyFarm has earned its place in the exclusive The MICHELIN Guide so it’s worth checking out on one of your fancy dates. Address: 28-1 Yeoeuido-dong, Yeongdeungpo-gu, Seoul, 02-2055-4445. This place looks beautiful! I hope I get chance to visit before we leave Korea, looks like the perfect place to get some great photos. How was the food? You’re the 2nd person to write about this grandiouse place (with Emre Kanik being the first haha with lots of great indoor pictures). Your post is also informative for the Kpop fans and foodies in and around Seoul. If I had a fancy post wedding party, I’d definitely book this place too! You made me visit Emre’s blog. Great pictures, indeed! I was there for an appreciation dinner so it would have been awkward if I took photos, hahaha!